DESDE TEMPRANA HORA DEL DIA MARTES 4 DE JUNIO DEL PRESENTE EL ING. 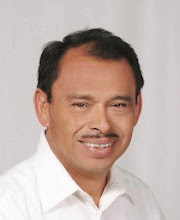 APOLINAR FLORES VELASQUEZ CONTINUO CON INTENSIDAD SU CAMPAÑA CON MIRAS A LA ELECCION PARA LA ALCALDIA DE FORTIN DE LAS FLORES, VER. DANDO A CONOCER A LA CIUDADANIA SUS PROPUESTAS Y COMPROMISOS. POR TODOS LADOS FUE BIEN RECIBIDO ESTANDO A SU PASO POR EL MERCADO 3 DE AGOSTO EN DONDE LOS LOCATARIOS SE INTERESARON POR CONOCER SU PROYECTO QUE PERMITA SACAR AL MUNICIPIO DE LA MARGINACION EN QUE HA CAIDO EN LOS ULTIMOS AÑOS. EL ING. APOLINAR FLORES AL UNISONO DE SU PLANILLA ESCUCHARON EL SENTIR DE LA GENTE Y DISPUSIERON ORIENTAR TODAS SUS DEMANDAS QUE SON DEL TODO JUSTAS HACIA EL PROYECTO DE GOBIERNO QUE ESPERARAN IMPLEMENTAR CON EL APOYO DE LA GENTE. A SU PASO POR LA ESTACION DEL TREN LAS FAMILIAS AGRADECIERON SU PRESENCIA Y LE REFRENDERADARON SU TOTAL APOYO PARA IMPLEMENTAR EL CAMBIO TAN ANHELADO EN LA ADMINISTRACION PUBLICA MUNICIPAL. EL CANDIDATO DEL PT LES RECORDO QUE AL SER FAVORECIDO CON SU VOTO GOBERNARA PARA TODOS Y LA MUESTRA DE SU HONESTIDAD ESTA A LA VISTA DE TODOS Y COMO REFERENCIA ESTAN LOS 34 AÑOS QUE LABORO EL HOLDING APASCO SIEMPRE DESTACANDOSE POR SU TRATO JUSTO Y TRANSPARENTE CON TODOS LOS QUE TUVIERON ALGUNA RELACION CON EL POR LO QUE LES CONFIRMA SU CONTINUIDAD EN ESTE SENTIDO DADO QUE 4 AÑOS EN UNA ALCALDIA NO CAMBIARIAN DE NINGUNA MANERA SU CONOCIDO PROCEDER. ¡POLIN AL RESCATE DE FORTIN!